Am so happy to review a wonderful cookbook 'Cooking Light, The Complete Quick Cook' with delicious recipes for health conscientious, busy households by the multiple award winning cookbook authors duo Mark Scarbrough and Bruce Weinstein. Regular contributors to Cooking Light, Gourmet and Food and Travel among other magazines as well as national TV appearances on the Today, The Early Show and The View to name a few. True story, over the last month, I was phasing out of canned beans like chickpeas I use frequently for many recipes on a weekly basis, kidney beans I use for chili and black beans I mostly use for rice and beans. I found my pantry shelves depleting slowly while I had dry beans from bulk section of the market accumulating. I had romantic notions of soaking beans overnight, yes I do it from time to time, but for everyday realities it is highly impractical. That is where Mark's and Bruce's 'Cooking Light, The Complete Quick Cook' comes in super handy with many clever timesaving tips while not sacrifying flavor. Sound advice on essential kitchen tools, herbs every cook should stock are just a couple of infinite suggestions for today's lifestyles. First I met Mark via Twitter then Bruce shortly thereafter. Their wit and smarts are unmatched, made for real good twitter chuckles. Love their twitter discussions about kitchen myths and goats and just to prove my point, Real Food Has Curves, is the title of their site and a cookbook, one out of a collection of 20 books they have written....and yes, let's not forget their dog Dreydl. I made this delicious quick Mediterranean Kofta dish but replaced the yogurt suggested in the original recipe with a drizzle of tahini as a substitute. In the spirit of Food Wanderings' continued second blog anniversary celebration, I am offering my preview copy of Cooking Light, The Complete Quick Cook to one lucky reader. I hope someone, ahem J, will get me, my very own copy, for the December holidays. Photo, recipe and preview giveaway book courtesy of Cooking Light, shipping courtesy of Food Wanderings. 1. Follow @MarkScarbrough, @BruceWeinstein and @Cooking_Light. 2. Follow @foodwanderings on twitter and LIKE FoodWanderings' FB page. 3. Tweet ob twitter or post on your FB page this GIVEAWAY. 4. Drawing will be done randomly. All comments, up to four each, should be posted by midnight Saturday, November 19. 5. Shipping only to a US address. Sorry my friends overseas. 2. Combine first 12 ingredients in a large bowl; stir just until combined. Divide mixture into 8 equal portions; shape each portion into a 2-inch patty. Place patties on a jelly-roll pan coated with cooking spray. Broil 4 minutes on each side or until desired degree of doneness. Place 1 tomato slice and 1 patty in each pita half. YIELD: 4 servings (serving size: 2 filled pita halves). YAY for another giveaway! I'm already following Mark, you and Cooking Light! And now following Bruce too! Now onto the recipe! I love the way you've presented the kofte! I like that the recipe is simple and calls for all pantry staples! Can't wait to get my hands on this book! Lovely kofte! A pity that giveaway is not open to people overseas. This sounds like a fabulous book! If anyone needs a practical guide to cooking it is absolutely me! Love the Kofte! Delicious - just what we love! I already follow you on twitter and facebook, babes! And Stumble Upon! I already follow Bruce and Mark on Twitter and just added Cooking Light! Wow, another great giveaway! And those kofte look awesome, I will have to make them soon. I followed those folks on twitter and already followed Cooking Light! I would love to win the book. It's a great review you did and who can say so to a book which helps you to cook quick. I love this light meal, simple and delicious! I love these guys; got to know them during 'Goaterie' this year and am impressed with their wealth of knowledge. Besides...they're fun too! I already follow Bruce, Mark, Cooking Light and you on Twitter. I have been a subscriber to Cooking Light for years and love their recipes. 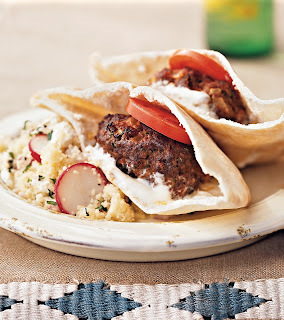 This kofte recipe looks delicious and I like your substitution of tahini for the yogurt. Love this recipe! I want the Cooking Light cookbook! Glad you shared this with us. Must try making this soon! Happy Mon.,Shulie! Shulie, I've been phasing out canned chick peas and beans and have bags upon bags of the same dried with the idea of soaking them overnight - helloooo!! :) I love kofte and this recipe! I'm following all three on Twitter now! I use Cooking Light recipes and would love to win this cookbook! Lovely recipe and hooray for blogiversaries, celebrations and giveaways :D I was following everyone except Bruce. Following now! WANT it!! Please give it to me :-) I follow you on twitter. I am now following @Cooking_Light, Shulie! Thanks. Ha, I thought I had left you comments already, and I am so glad to come back. You know I visit often. Following Bruce now also. Mark and I have been following each other for quite a bit. I just shared this post on FB! Happy 2nd Blog Anniversary, Shulie! And of course, I am you FB fan!